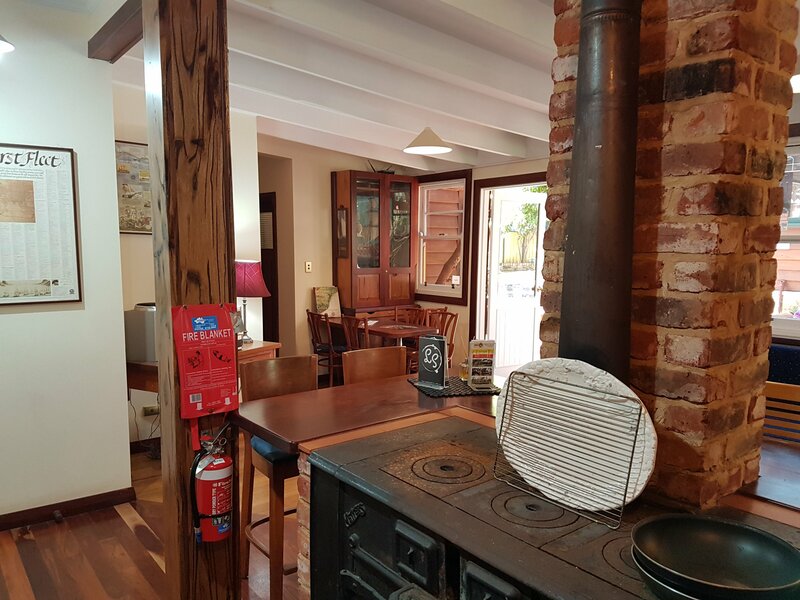 Admiral Stirling Inn is accommodation full of individual character, sure to add something memorable of its own to the Margaret River experience. 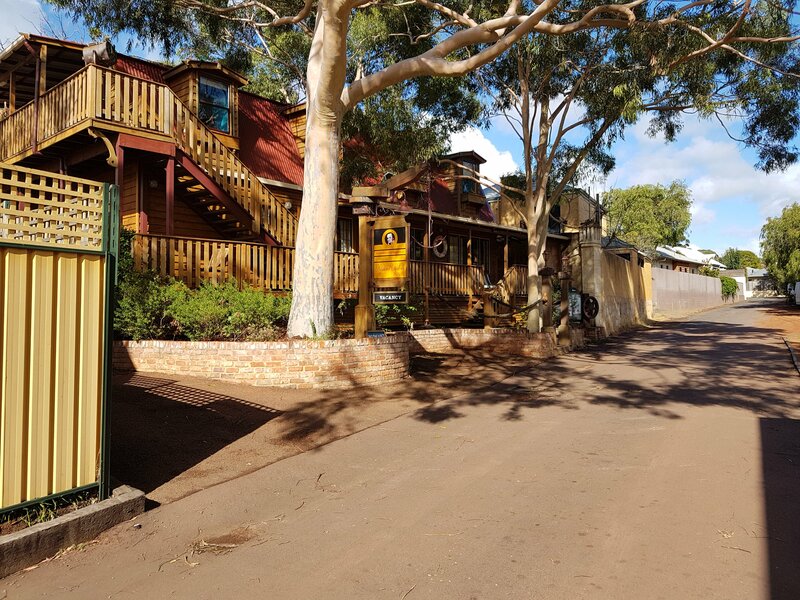 Admiral Stirling Inn offers affordable accommodation, conveniently located in Margaret River, within walking distance of all the restaurants, shops and business the township has to offer, as well as to the walk and bicycle trails by the Margaret River. Accommodation quarters, some fully self-contained, are to suit individuals, twin share arrangements, couples, and small groups or families, and all have bathroom facilities with hairdryer, tea and coffee-making facilities, reverse-cycle air-conditioning, as well as a TV/DVD in each bedroom. FREE WIFI available. Admiral Stirling Inn welcomes you aboard! Reception for the Inn is just opposite at Adamsons (71 Bussell Hwy) to check in. 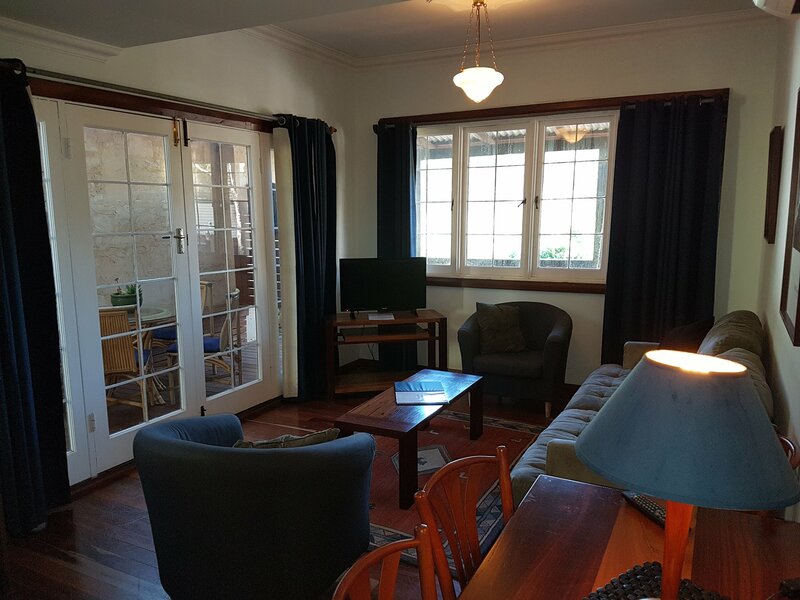 Located on the ground floor, and designed for a small family or group, the Admiral's Quarters have two bedrooms, one with Queen Bed and one with Double Bed, as well as a fold-down Queen-width sofa bed in the lounge room. The lounge 'armchairs' are original c1904 backbenches from the WA Legislative Council. Combined with extensive use of local hardwood timbers throughout, and leadlight windows, the Admiral's Quarters offer something truly memorable for the discerning holiday-maker. Equipped too with kitchen-dining, bathroom with shower and toilet, as well as TV-DVD, stereo hi-fi and clock-radios, and Free WIFI, the private amenities of the Admiral's Quarters are enhanced by all-guest facilities such as beautiful undercover barbecue area, in which to share holiday experiences with other travellers if desired. No check in or check outs on Christmas day. Check In at Adamson's Reception just across the street (71 Bussell Hwy) Located on the ground floor, and designed for a small family or group, the Admiral's Quarters have two bedrooms, one with Queen Bed and one with Double Bed, as well as a fold-down Queen-width sofa bed in the lounge room. The lounge 'armchairs' are original c1904 backbenches from the WA Legislative Council. Combined with extensive use of local hardwood timbers throughout, and leadlight windows, the Admiral's Quarters offer something truly memorable for the discerning holiday-maker. Equipped too with kitchen-dining, bathroom with shower and toilet, as well as TV-DVD, stereo hi-fi and clock-radios, and Free WIFI, the private amenities of the Admiral's Quarters are enhanced by all-guest facilities such as beautiful undercover barbecue area, in which to share holiday experiences with other travellers if desired. No check in or check outs on Christmas day. Reception for the Inn is just opposite at Adamsons (71 Bussell Hwy) to check in. 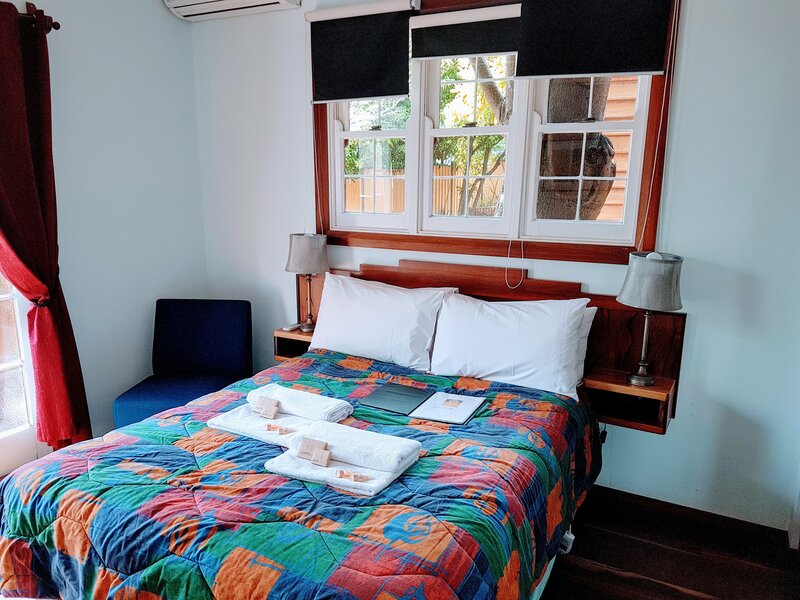 Located on the ground floor, and designed for a small family or group, the Admiral's Quarters have two bedrooms, one with Queen Bed and one with Double Bed, as well as a fold-down Queen-width sofa bed in the lounge room. The lounge 'armchairs' are original c1904 backbenches from the WA Legislative Council. Combined with extensive use of local hardwood timbers throughout, and leadlight windows, the Admiral's Quarters offer something truly memorable for the discerning holiday-maker. 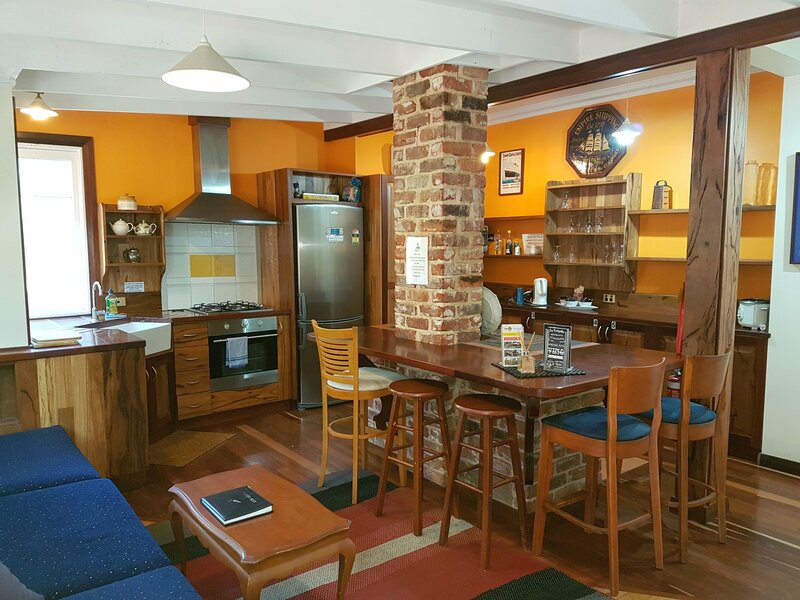 Equipped too with kitchen-dining, bathroom with shower and toilet, as well as TV-DVD, stereo hi-fi and clock-radios, and Free WIFI, the private amenities of the Admiral's Quarters are enhanced by all-guest facilities such as beautiful undercover BBQ area. No check in or outs on Christmas day. 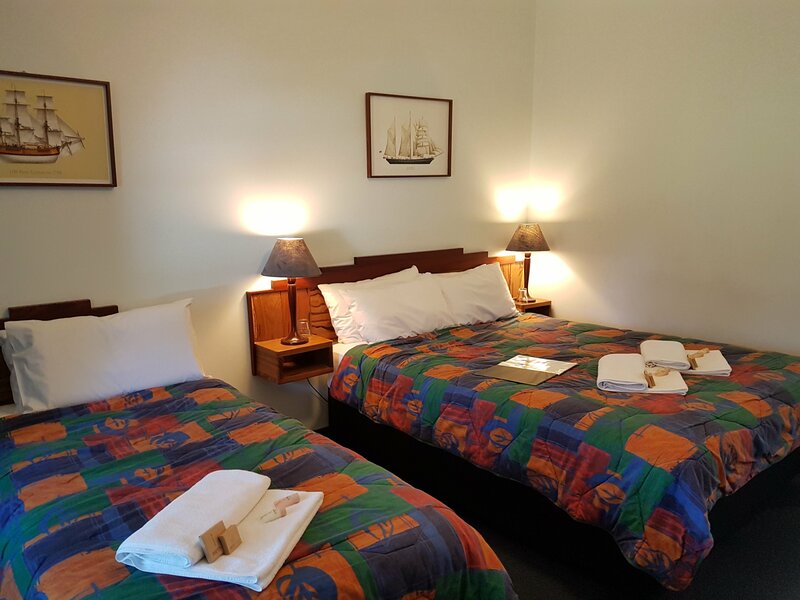 Check In at Adamson's just across the street (71 Bussell Hwy) Located on the ground floor, and designed for a small family or group, the Admiral's Quarters have two bedrooms, one with Queen Bed and one with Double Bed, as well as a fold-down Queen-width sofa bed in the lounge room. The lounge 'armchairs' are original c1904 backbenches from the WA Legislative Council. Combined with extensive use of local hardwood timbers throughout, and leadlight windows, the Admiral's Quarters offer something truly memorable for the discerning holiday-maker. 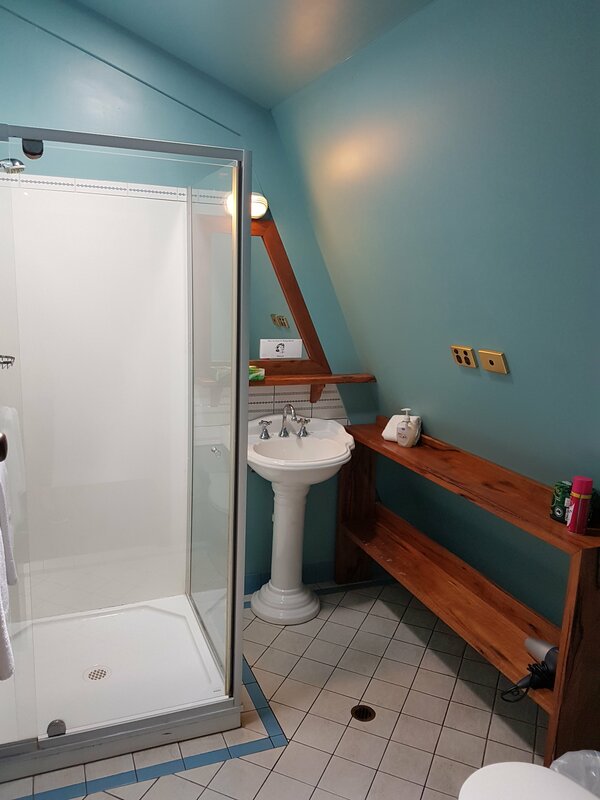 Equipped too with kitchen-dining, bathroom with shower and toilet, as well as TV-DVD, stereo hi-fi and clock-radios, and Free WIFI, the private amenities of the Admiral's Quarters are enhanced by all-guest facilities such as beautiful undercover BBQ area. No check in or outs on Christmas day. Reception for the Inn is just opposite at Adamsons (71 Bussell Hwy) to check in. 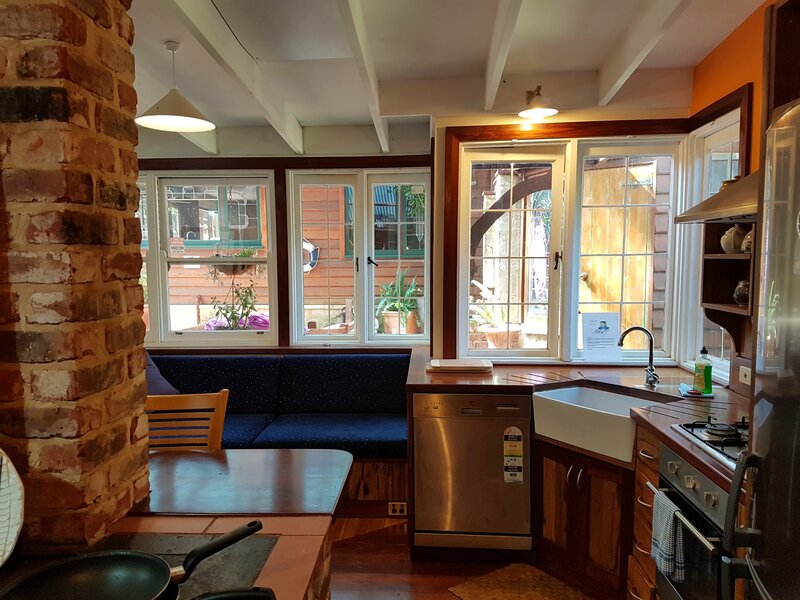 The same grounds but separate from the principal Inn accommodations, the Boatswain's Quarters are an open-plan suite, with screened deck for two, fit for a master of the deck and cabin mate! A large bedroom with Queen Bed, 'robes and sofa, has an ensuite with shower and toilet. A full kitchen combined with dining, is crafted from local hardwood timbers for regional authenticity and warmth. 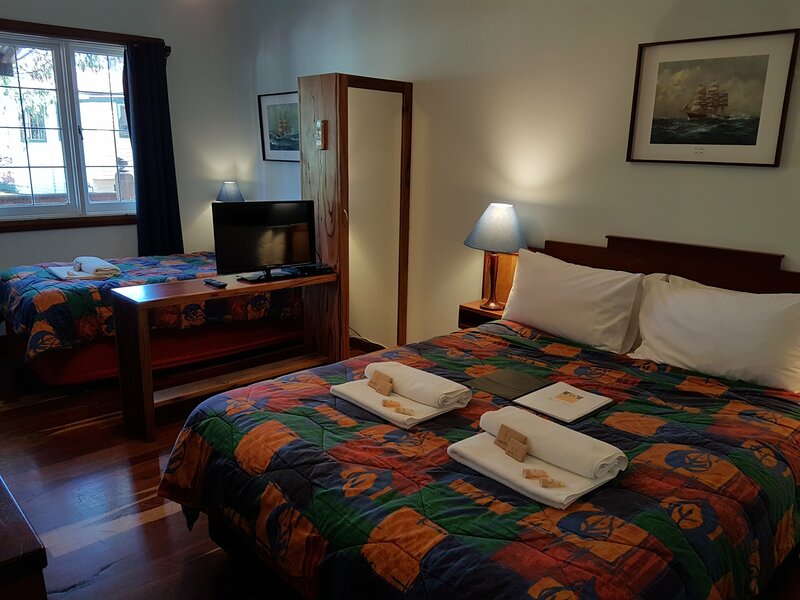 The Boatswain's Quarters have reverse-cycle air-conditioning, TV-DVD and stereo, with wireless internet access available. All-guest facilities, such as the under-cover barbecue area, where you might exchange travellers' tales in a traditionally Australian way, are to be taken advantage of too. No check ins or check outs on Christmas day. Reception for the Inn is just opposite at Adamsons (71 Bussell Hwy) to check in. 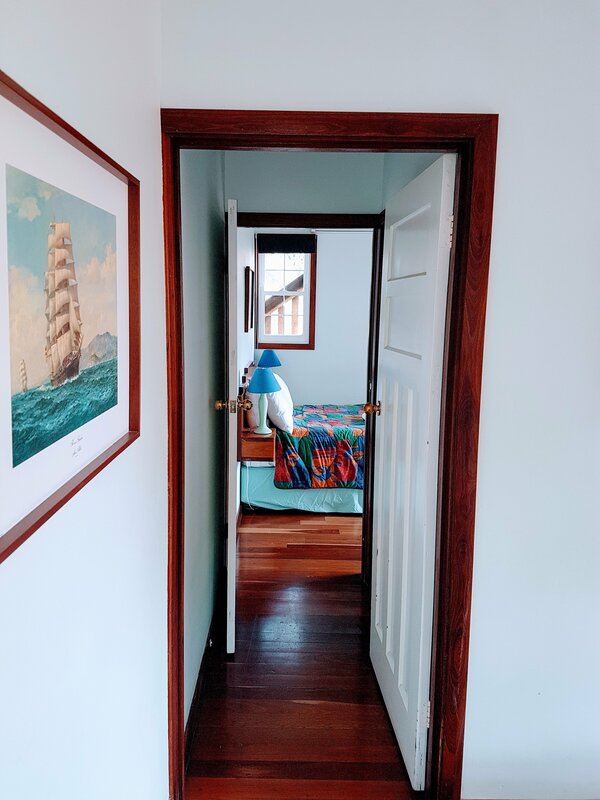 In the same grounds but separate from the principal Inn accommodations, the Boatswain's Quarters are an open-plan suite, with screened deck for two, fit for a master of the deck and cabin mate! A large bedroom with Queen Bed, 'robes and sofa, has an ensuite with shower and toilet. A full kitchen combined with dining, is crafted from local hardwood timbers for regional authenticity and warmth. 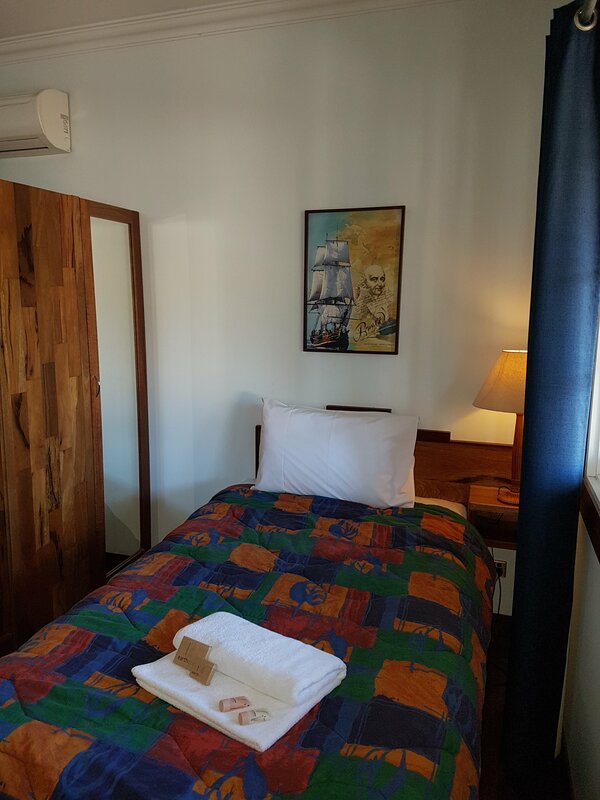 The Boatswain's Quarters have reverse-cycle air-conditioning, TV-DVD and stereo, with wireless internet access available. All-guest facilities, such as the under-cover barbecue area, where you might exchange travellers' tales in a traditionally Australian way, are to be taken advantage of too. No check ins or check outs on Christmas day. Reception for the Inn is just opposite at Adamsons (71 Bussell Hwy) to check in. 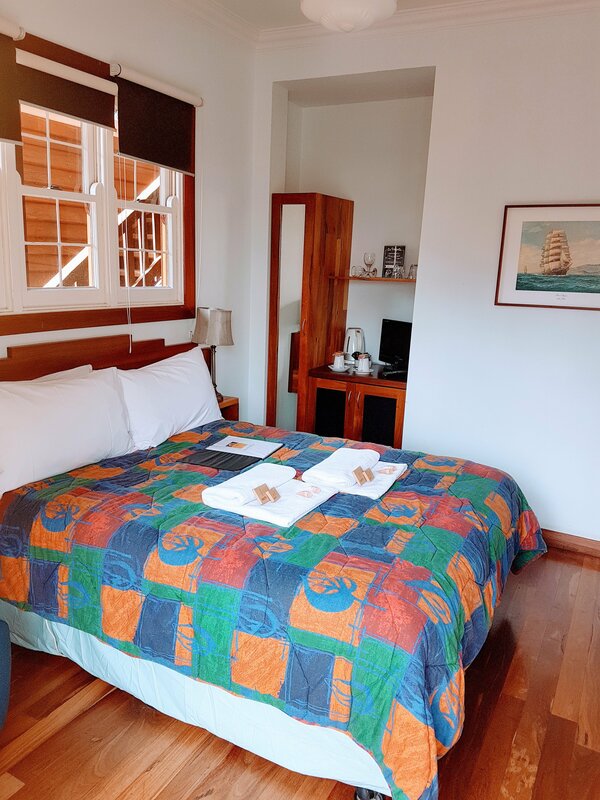 The Captain's Quarters are located on the ground floor, and are designed for a small family. 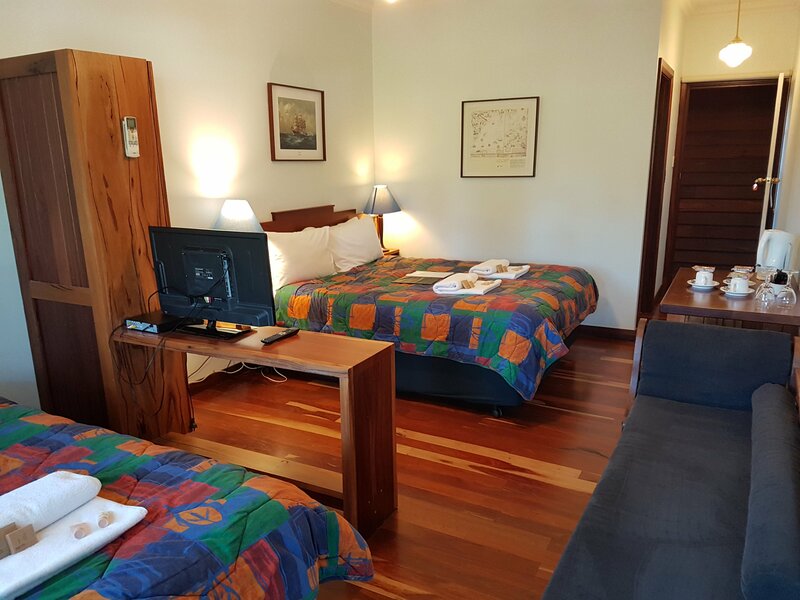 It offers a Queen Bed and King Single Bed in one large bedroom, with a fold-down Queen-width sofa bed in the lounge room, as well as bathroom with shower and toilet, with hairdryer. The Captain's Quarters are equipped with kitchen, dining nook and lounge, as well as TV-DVD, stereo hi-fi and clock-radio. Wireless internet facilities are available, as are communal facilities offered to guests by Admiral Stirling Inn, to share holiday experiences with other travellers if desired. With use of local hardwood timbers, in a character building in a leafy setting back from the highway, this accommodation is unique and an opportunity to add more memories to a sojourn in this incomparable region. No check ins or check outs on Christmas day. Check In at Reception at Adamson's just across the street (71 Bussell Hwy) The Captain's Quarters is located on the ground floor, and is designed for a small family. 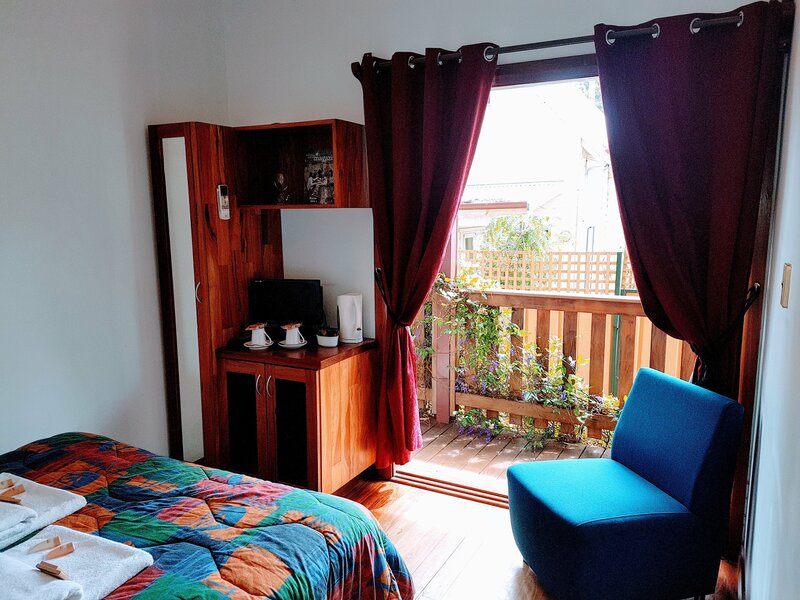 It offers a Queen Bed and King Single Bed in one large bedroom, with a fold-down Queen-width sofa bed in the lounge room, as well as bathroom with shower and toilet, with hairdryer. The Captain's Quarters is equipped with kitchen, dining nook and lounge. 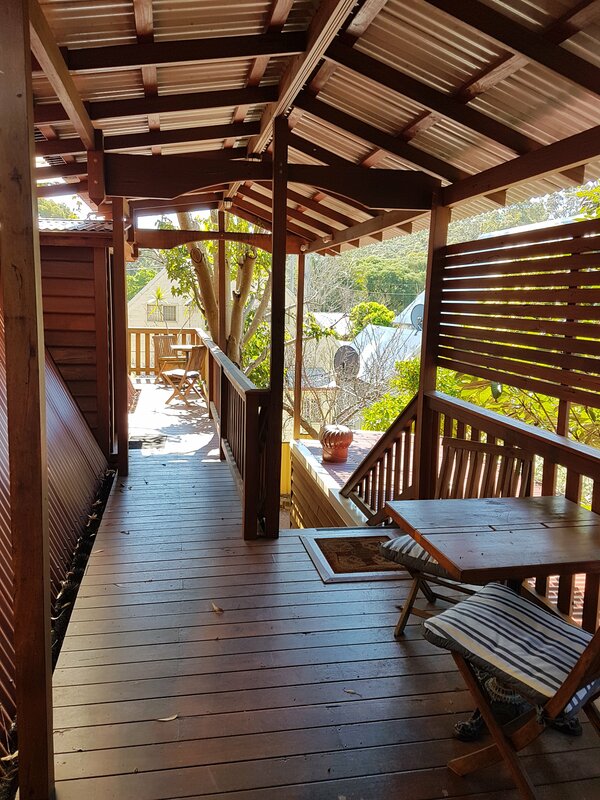 Free WIFI as well as TV-DVD, Private covered deck and BBQ With use of local hardwood timbers, in a character building in a leafy setting back from the highway, this accommodation is unique and an opportunity to add more memories to a sojourn in this incomparable region. No check ins or check outs on Christmas day. Reception for the Inn is just across the street at Adamsons (71 Bussell Hwy) to check in. 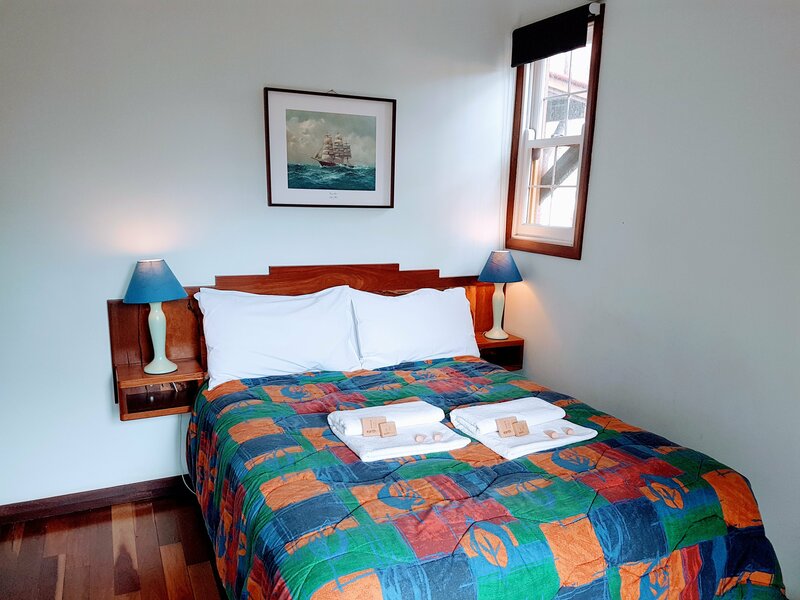 The Captain's Quarters are located on the ground floor, and are designed for a small family. It offers a Queen Bed and King Single Bed in one large bedroom, with a fold-down Queen-width sofa bed in the lounge room, as well as bathroom with shower and toilet, with hairdryer. The Captain's Quarters is equipped with kitchen, dining nook and lounge, as well as Private covered deck with BBQ. TV-DVD, Free WIFI With use of local hardwood timbers, in a character building in a leafy setting back from the highway, this accommodation is unique and an opportunity to add more memories to a sojourn in this incomparable region. No check ins or check outs on Christmas day. Reception for the Inn is just across the street at Adamsons (71 Bussell Hwy) to check in. 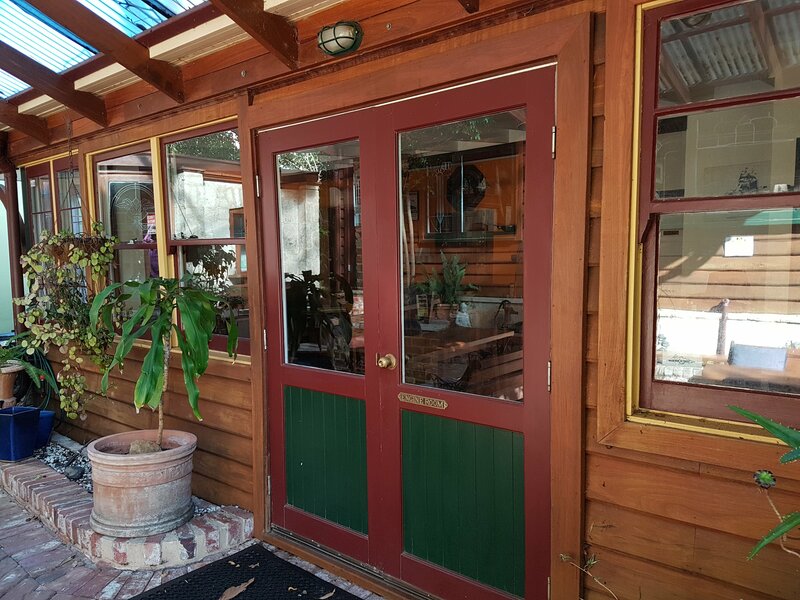 The Captain's Quarters is located on the ground floor, and is designed for a small family. It offers a Queen Bed and King Single Bed in one large bedroom, with a fold-down Queen-width sofa bed in the lounge room, as well as bathroom with shower and toilet, with hairdryer. The Captain's Quarters is equipped with kitchen, dining nook and lounge, Private covered deck with BBQ TV-DVD Free WIFI With use of local hardwood timbers, in a character building in a leafy setting back from the highway, this accommodation is unique and an opportunity to add more memories to a sojourn in this incomparable region. No check ins or check outs on Christmas day. Reception for the Inn is just opposite at Adamsons (71 Bussell Hwy) to check in. The Double Twin Room, located on the ground floor, is designed for two to four people. Extra person $30 per night. Ideal for two who like twin share with a bit more room or for two couples travelling together in close company. 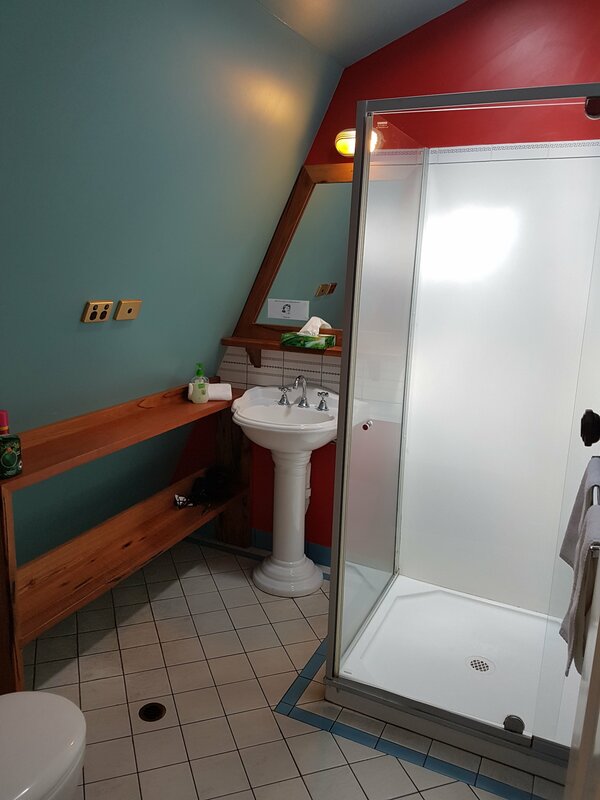 Two bedrooms, separated by ensuite with shower, toilet, hairdryer, electric blanket. Each have a double bed and private TV-DVD. The Double Twin Room has its own tea and coffee-making facilities, and bar fridge. Free WIFI . Guests have the use of a fully equipped communal kitchen, and pleasant under cover barbecue area. No check ins or check outs on Christmas or New Years Day. 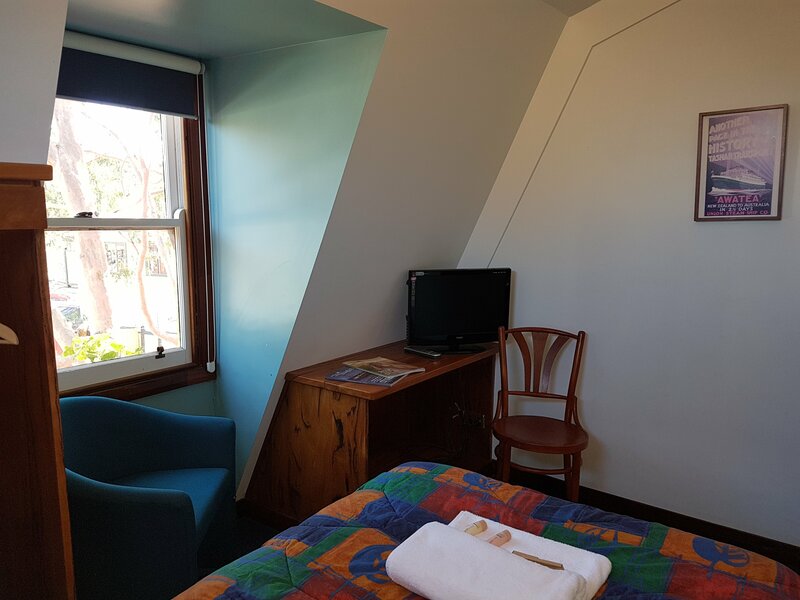 Check In at Reception located just across the street at Adamsons (71 Bussell Hwy) The Double Twin Room, located on the ground floor, is designed for two up to four people. Extra person $30 per night. Ideal for two who like twin share with a bit more room or for two couples travelling together in close company. Two bedrooms, separated by ensuite with shower, toilet, hairdryer, electric blanket. Each have a double bed and private TV-DVD. The Double Twin Room has its own tea and coffee-making facilities, and bar fridge. Free WIFI . Guests have the use of a fully equipped communal kitchen, and pleasant under cover barbecue area. No check ins or check outs on Christmas or New Years Day. Reception for the Inn is just opposite at Adamsons (71 Bussell Hwy) to check in. The Double Twin Room, located on the ground floor, is designed for two to four people Extra person $30 per night. Ideal for two who like twin share with a bit more room or for two couples travelling together in close company. Two bedrooms, separated by ensuite with shower, toilet, hairdryer, electric blanket. Each have a double bed and private TV-DVD. The Double Twin Room has its own tea and coffee-making facilities, and bar fridge. Free WIFI . Guests have the use of a fully equipped communal kitchen, and pleasant under cover barbecue area. .Admiral Stirling Inn highly recommends La Scarpetta Restaurant, just across the lane. No check ins or check outs on Christmas or New Years Day. 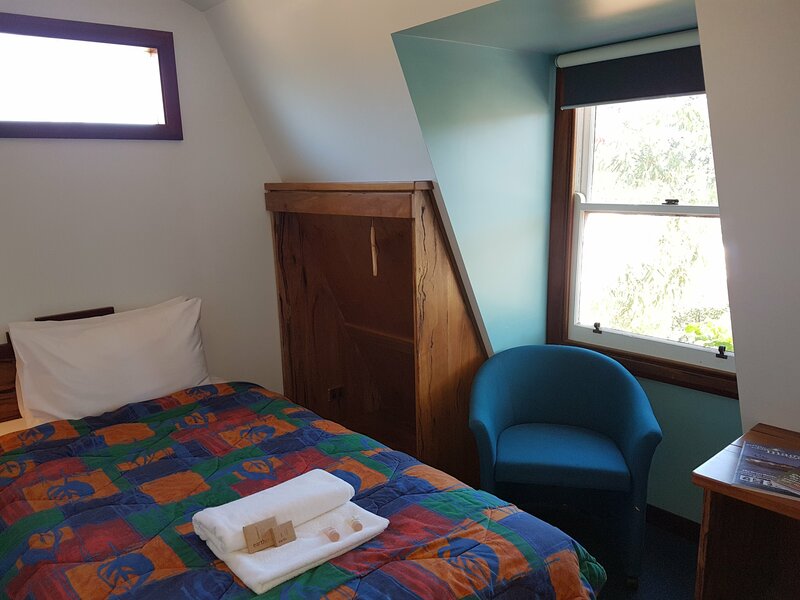 Check In at Reception just across the street at Adamsons (71 Bussell Hwy) The Double Twin Room, located on the ground floor, is designed for two to four people Extra person $30 per night. Ideal for two who like twin share with a bit more room or for two couples travelling together in close company. Two bedrooms, separated by ensuite with shower, toilet, hairdryer, electric blanket. Each have a double bed and private TV-DVD. The Double Twin Room has its own tea and coffee-making facilities, and bar fridge. Free WIFI . Guests have the use of a fully equipped communal kitchen, and pleasant under cover barbecue area. .Admiral Stirling Inn highly recommends La Scarpetta Restaurant, just across the lane. No check ins or check outs on Christmas or New Years Day. Check IN at Adamson's Reception just across the street (71 Bussell Hwy) The Double Twin Room, located on the ground floor, is designed for two to four people Extra person $30 per night. Ideal for two who like twin share with a bit more room or for two couples travelling together in close company. Two bedrooms, separated by ensuite with shower, toilet, hairdryer, electric blanket. Each have a double bed and small TV-DVD. The Double Twin Room has its own tea and coffee-making facilities, and bar fridge. Free WIFI . Guests have the use of a fully equipped communal kitchen, and pleasant under cover barbecue area. .Admiral Stirling Inn highly recommends La Scarpetta Restaurant, just across the lane. No check ins or check outs on Christmas or New Years Day. Reception for the Inn is just opposite at Adamsons (71 Bussell Hwy) to check in. 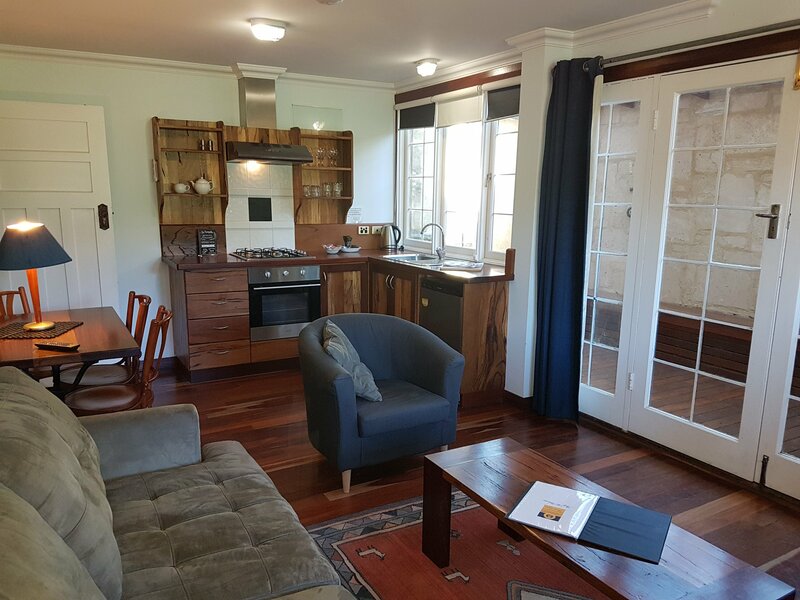 Located upstairs, and designed for a family or small group, the Governor's Quarters have three bedrooms two each with Queen Bed as well as a Queen Bed and two Single Beds on a "crow's nest" mezzanine floor.Rate 4 persons. Extra person $30 per night. The lounge 'armchairs' are original c1904 backbenches from the WA Legislative Council. Combined with extensive use of local hardwood timbers throughout, and leadlight windows, the Governor's Quarters offer something truly memorable for the discerning holiday-maker. Equipped too with kitchen-dining, two bathrooms each with shower and toilet, as well as TV-DVD, stereo hi-fi and clock-radios, Free WIFI the private amenities of the Governor's Quarters are enhanced by all-guest facilities such as beautiful undercover barbecue area, in which to share holiday experiences with other travellers if desired. Admiral Stirling Inn highly recommends La Scarpetta Restaurant, located just across the lane.No check in or out on Christmas day. Reception for the Inn is just opposite at Adamsons (71 Bussell Hwy) to check in. 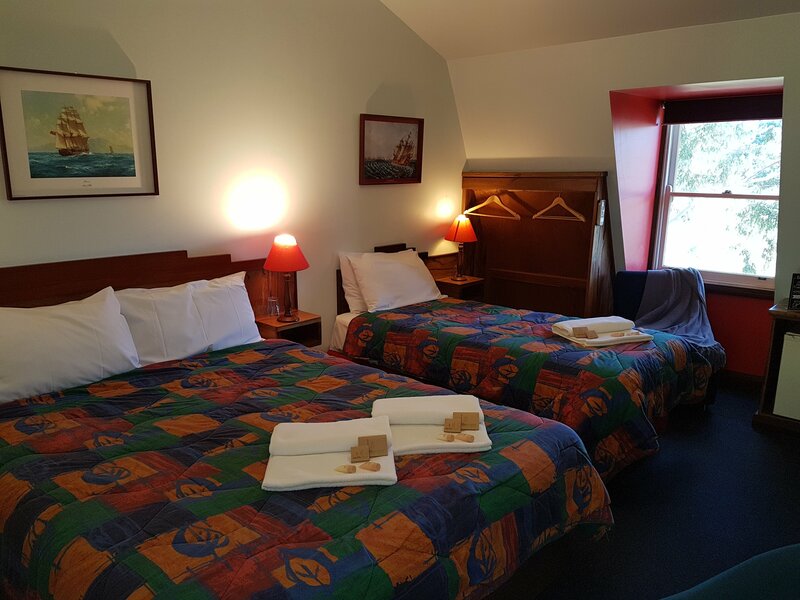 Located upstairs, and designed for a family or small group, the Governor's Quarters have three bedrooms two each with Queen Bed as well as a Queen Bed and two Single Beds on a "crow's nest" mezzanine floor. Rate is for 4 People. Extra person $30 per night. The lounge 'armchairs' are original c1904 backbenches from the WA Legislative Council. Combined with extensive use of local hardwood timbers throughout, and leadlight windows, the Governor's Quarters offer something truly memorable for the discerning holiday-maker. Equipped too with kitchen-dining, two bathrooms each with shower and toilet, as well as TV-DVD, stereo hi-fi and clock-radios, Free WIFI, the private amenities of the Governor's Quarters are enhanced by all-guest facilities such as beautiful undercover barbecue area, in which to share holiday experiences with other travellers if desired. Admiral Stirling Inn highly recommends La Scarpetta Restaurant, located just across the lane. No check ins or check outs on Christmas day. Reception for the Inn is located at Adamsons (71 Bussell Hwy) for check in. The Stern is located in a single-storey building and, as the name suggests, at the rear of the Inn's accommodation buildings. As the tariff and name might also suggest, the Stern is not the flagship of Admiral Stirling Inn accommodations, being older style and yet to be fully refurbished - but the Stern is clean, comfortable and well situated. Better suited to two people, the Stern is able to accommodate a family of up to four for a shorter stay. As well as queen bed in one room, there is a double pull out sofa in the sitting room. 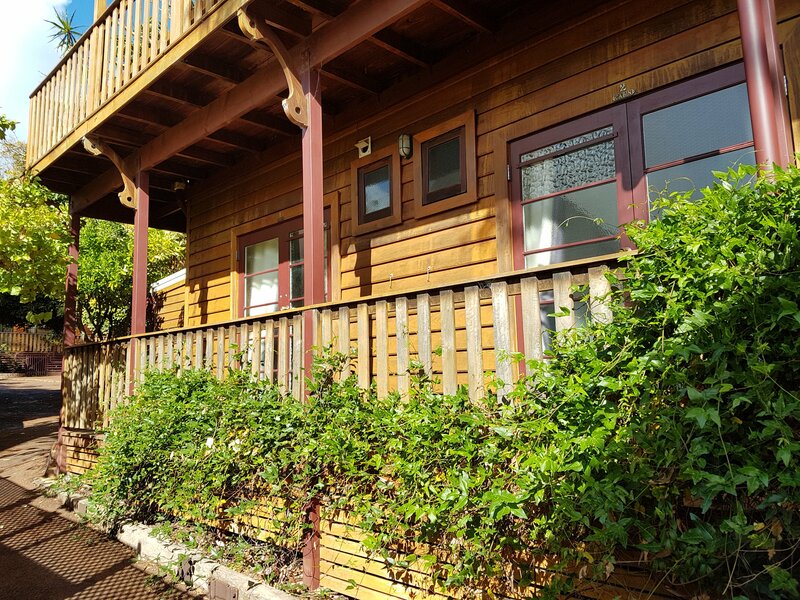 The Stern has a bathroom, offers cooking facilities, and has a screened covered deck with outdoor setting, which overlooks established greenery and the length of the Inn property. The Stern also has reverse-cycle air-conditioning, TV-DVD and stereo, and Free WIFI. No check ins or check outs on Christmas day. Reception for the Inn is located at Adamsons (71 Bussell Hwy) for check in. The Stern is located in a single-storey building and, as the name suggests, at the rear of the Inn's accommodation buildings. As the tariff and name might also suggest, the Stern is not the flagship of Admiral Stirling Inn accommodations, being older style and yet to be fully refurbished - but the Stern is clean, comfortable and well situated. Better suited to two people, the Stern is able to accommodate a family of up to four for a shorter stay. 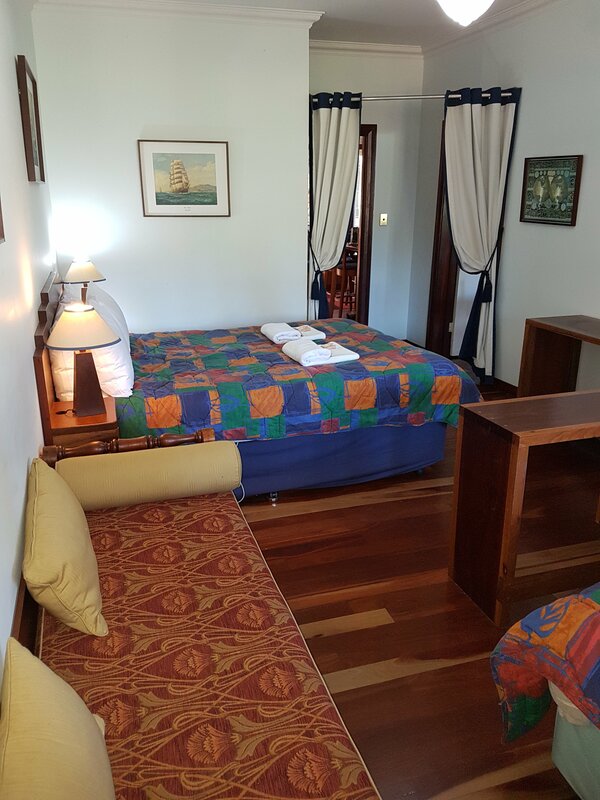 As well as queen bed in one room, there is a double pull out sofa in the sitting room.The Stern has a bathroom, offers cooking facilities, and has a screened covered deck with outdoor setting, which overlooks established greenery and the length of the Inn property. The Stern also has reverse-cycle air-conditioning, TV-DVD and stereo, and Free WIFI No check ins or check outs on Christmas day. Reception for the Inn is located at Adamsons (71 Bussell Hwy) for check in. The Stern is located in a single-storey building and, as the name suggests, at the rear of the Inn's accommodation buildings. As the tariff and name might also suggest, the Stern is not the flagship of Admiral Stirling Inn accommodations, being older style and yet to be fully refurbished - but the Stern is clean, comfortable and well situated. Better suited to two people, the Stern is able to accommodate a family of up to four for a shorter stay. As well as queen bed in one room, there is a double pull out sofa in the sitting room. 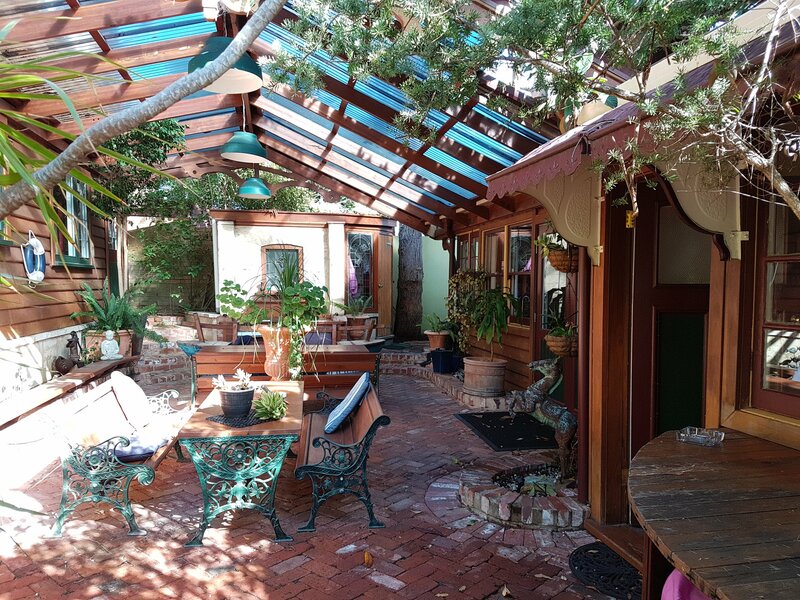 The Stern has a bathroom, offers cooking facilities, and has a screened covered deck with outdoor setting, which overlooks established greenery and the length of the Inn property. The Stern also has reverse-cycle air-conditioning, TV-DVD and stereo, and Free WIFI No check ins or check outs on Christmas day. Reception for the Inn is just opposite at Adamsons (71 Bussell Hwy) to check in. With Queen Bed and King Single Bed, our Triple Room is able to accommodate up to three people in one large bedroom. 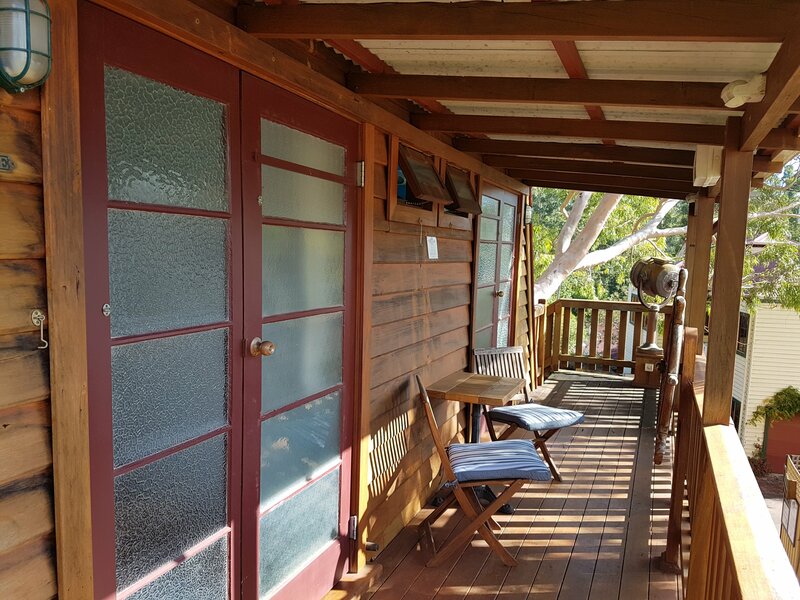 Extra person $30 per night, has an ensuite with shower and toilet, hairdryer. The Triple Room has its own TV-DVD, tea- and coffee-making facilities, small fridge, Free WIFI Admiral Stirling Inn's communal kitchen is available for guests use. 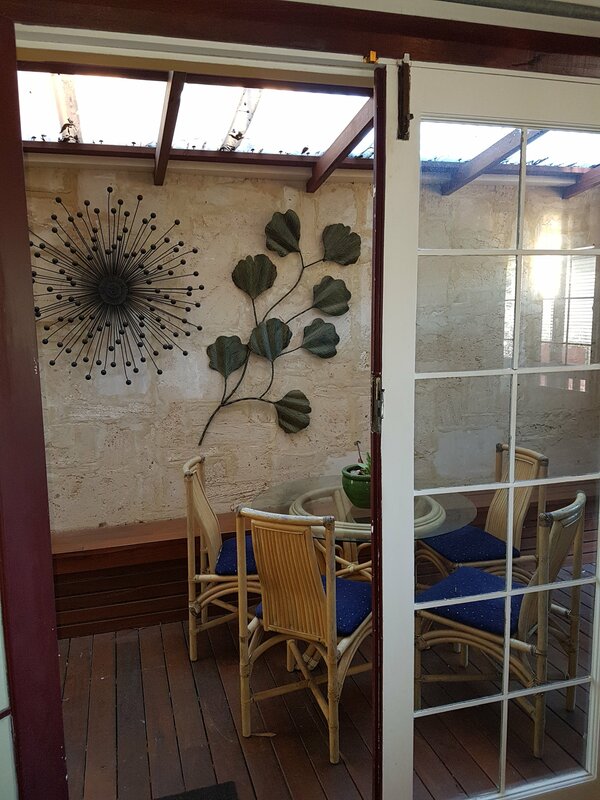 A pleasant under cover barbecue area is also available for guests to have a traditional Australian holiday experience. Rate is for 2 people extra person is $30 per night. No check in or check outs on Christmas Day. Reception for the Inn is just across the street at Adamsons (71 Bussell Hwy) to check in. With Queen Bed and King Single Bed, our Triple Room is able to accommodate up to three people in one large bedroom. 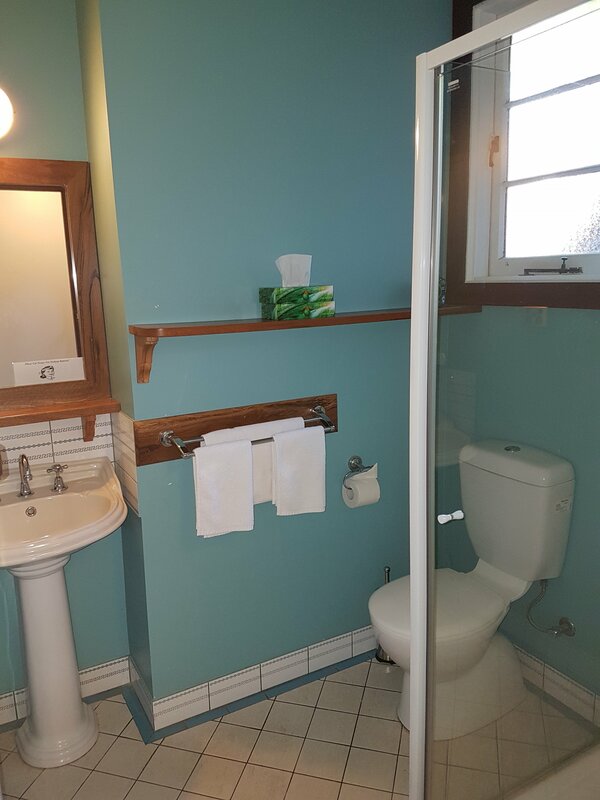 Extra person $30 per night, has an ensuite with shower and toilet, hairdryer. The Triple Room has its own small TV-DVD, tea- and coffee-making facilities, small fridge, Free WIFI Admiral Stirling Inn's communal kitchen is available for guests use. A pleasant under cover barbecue area is also available for guests to have a traditional Australian holiday experience. Rate is for 2 people extra person is $30 per night. No check in or check outs on Christmas Day. Reception for the Inn is just opposite at Adamsons (71 Bussell Hwy) to check in. With Queen Bed and King Single Bed, our Triple Room is able to accommodate up to three people in one large bedroom. 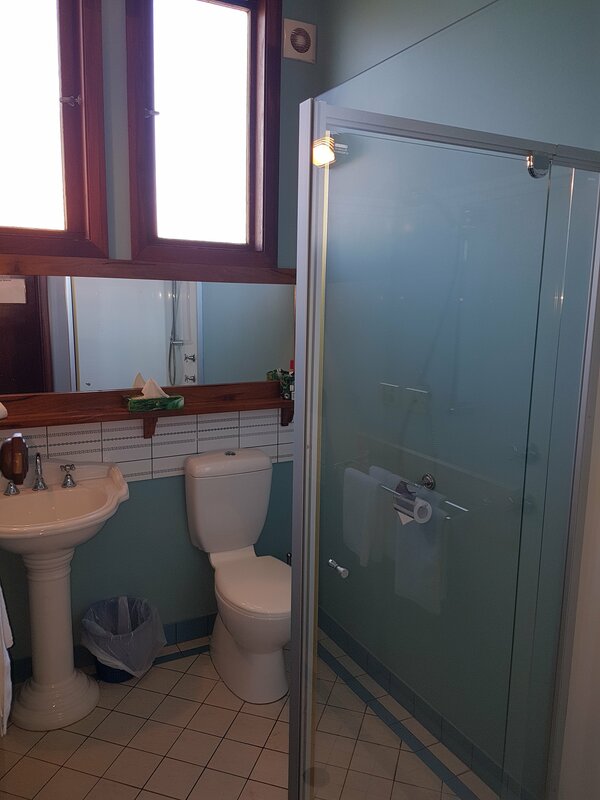 Extra person $30 per night, has an ensuite with shower and toilet, hairdryer. The Triple Room has its own TV-DVD, tea- and coffee-making facilities, bar fridge, Free WIFI Admiral Stirling Inn's communal kitchen is available for guests use. A pleasant under cover barbecue area is also available for guests to have a traditional Australian holiday experience. Rate is for 2 people extra person is $30 per night. No check in or check outs on Christmas Day. Reception for the Inn is just across the street at Adamsons (71 Bussell Hwy) to check in. With Queen Bed and King Single Bed, our Triple Room is able to accommodate up to three people in one large bedroom. 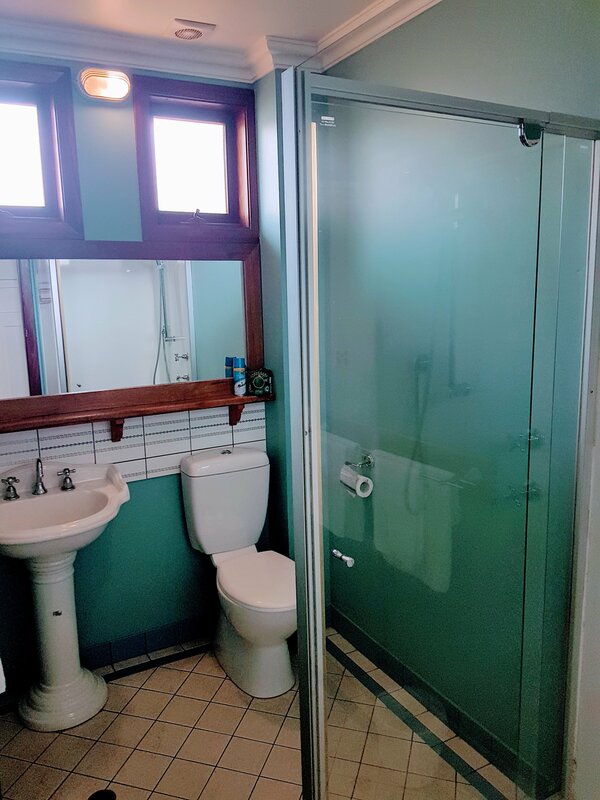 Extra person $30 per night, has an ensuite with shower and toilet, hairdryer. The Triple Room has a small TV-DVD, tea- and coffee-making facilities, bar fridge, Free WIFI Admiral Stirling Inn's communal kitchen is available for guests use. A pleasant under cover barbecue area is also available for guests to have a traditional Australian holiday experience. Rate is for 2 people extra person is $30 per night. No check in or check outs on Christmas Day. Reception for the Inn is just across the street at Adamsons (71 Bussell Hwy) to check in. With Queen Bed and King Single Bed, our Triple Room is able to accommodate up to three people in one large bedroom. 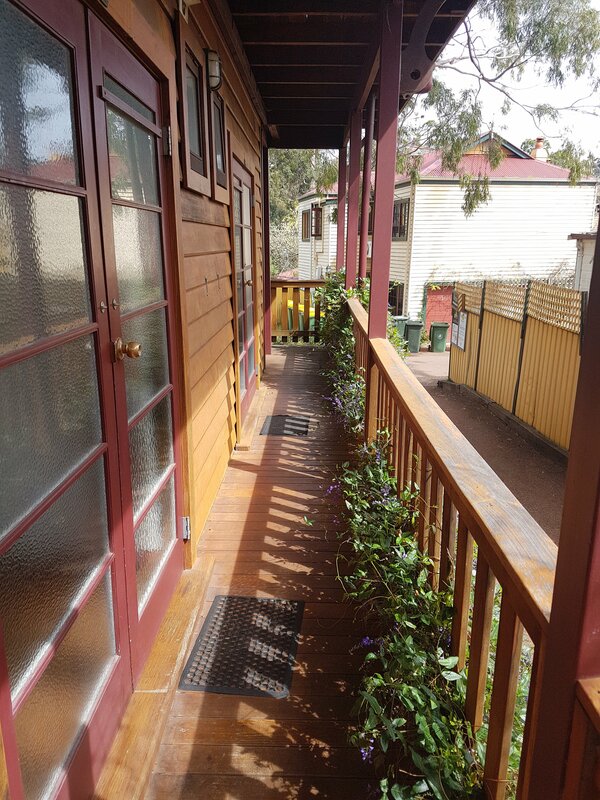 Extra person $30 per night, has an ensuite with shower and toilet, hairdryer. The Triple Room has a small TV-DVD, tea- and coffee-making facilities, bar fridge, Free WIFI Admiral Stirling Inn's communal kitchen is available for guests use. 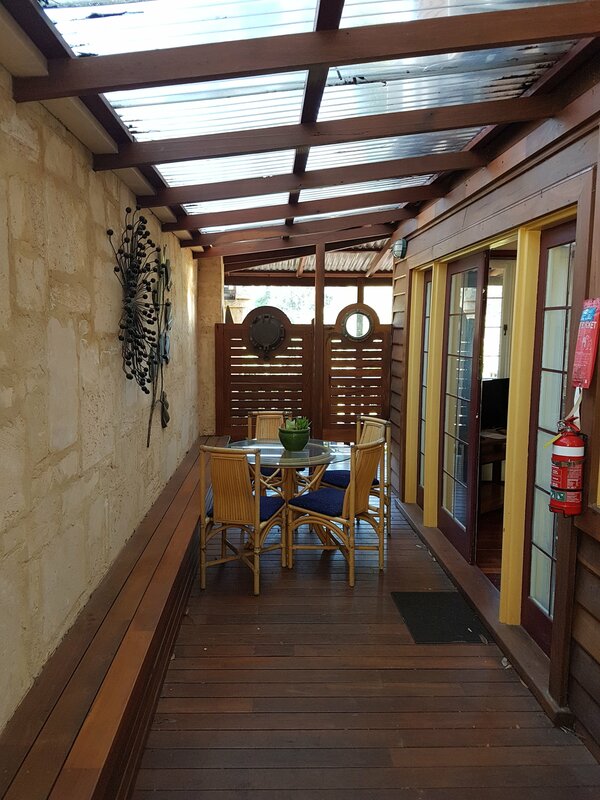 A pleasant under cover barbecue area is also available for guests to have a traditional Australian holiday experience. Rate is for 2 people extra person is $30 per night. Reception for the Inn is just opposite at Adamsons (71 Bussell Hwy) to check in. The Twin Room, located upstairs, is designed for two people travelling together, who still like the privacy of their own bedroom. Two bedrooms, separated by ensuite with shower, toilet, hairdryer. each have a single bed and private TV-DVD. The Twin Room has reverse-cycle air-conditioning between the two, its own tea and coffee-making facilities, and small fridge. FREE WIFI Use of fully equipped communal kitchen and pleasant undercover barbecue area. No check ins or check outs on Christmas Day. Reception for the Inn is just across the street at Adamsons (71 Bussell Hwy) to check in. The Twin Room, located upstairs, is designed for two people travelling together, who still like the privacy of their own bedroom. Two bedrooms, separated by ensuite with shower, toilet, hairdryer. each have a single bed and small TV-DVD. The Twin Room has reverse-cycle air-conditioning between the two, its own tea and coffee-making facilities, and small fridge. FREE WIFI Use of fully equipped communal kitchen and pleasant undercover barbecue area. No check ins or check outs on Christmas Day. Reception for the Inn is just opposite at Adamsons (71 Bussell Hwy) to check in. The Twin Room, located upstairs, is designed for two people travelling together, who still like the privacy of their own bedroom. Two bedrooms, separated by ensuite with shower, toilet, hairdryer. each have a single bed and private TV-DVD. The Twin Room has reverse-cycle air-conditioning between the two, its own tea and coffee-making facilities, and bar fridge. FREE WIFI Use of fully equipped communal kitchen and pleasant undercover barbecue area. No check ins or check outs on Christmas Day. Reception for the Inn is just across the street at Adamsons (71 Bussell Hwy) to check in. The Twin Room, located upstairs, is designed for two people travelling together, who still like the privacy of their own bedroom. 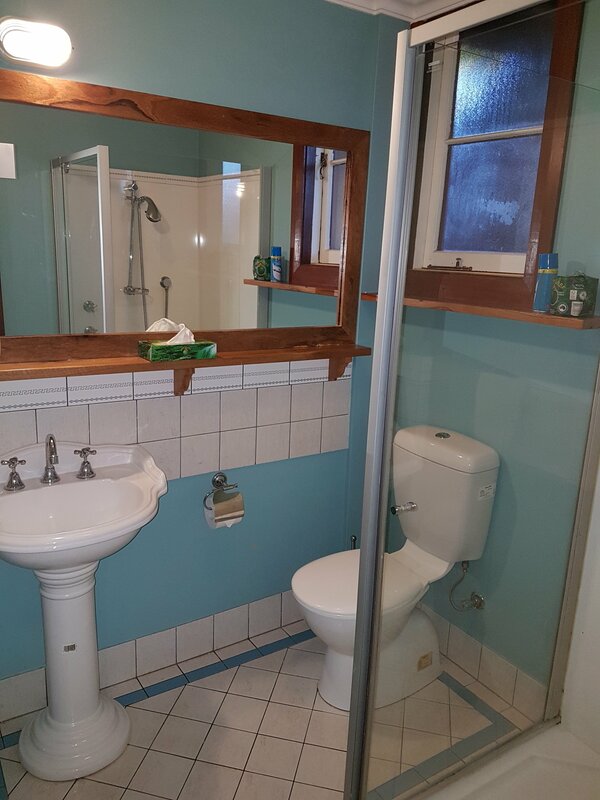 Two bedrooms, separated by ensuite with shower, toilet, hairdryer. each have a single bed and small TV-DVD. The Twin Room has reverse-cycle air-conditioning between the two, its own tea and coffee-making facilities, and bar fridge. FREE WIFI Use of fully equipped communal kitchen and pleasant undercover barbecue area. No check ins or check outs on Christmas Day. Free WIFI A coin-operated laundry is available on-site. Fully self-contained family suites for up to eight, as well as triple rooms with ensuite which contain queen as well as king single bed, some upstairs, are available for booking at Admiral Stirling Inn. Extra guests $30.00 per night. Free Parking is available on site and on the opposite side of the lane. Magnificent coastline to explore with beautiful beaches for swimming, snorkeling or surfing, or just walking along to bathe in a gorgeous sunset, - all this is a short country drive away from town, as are world class wineries, unique forests, flora and fauna, galleries and artisans, and a host of providores.